Most investors can’t escape the mainstream financial media machine. They watch screaming people on TV or read fear-inducing headlines urging switches from one stock or fund to another. It’s called the greed/fear cycle. Media love it because the emotions capture an audience and drive ad profits higher whether the info is beneficial or not. Usually it’s not. Most of it causes harm by urging precisely the wrong action to take. Brokers and financial planners love the greed/fear cycle because it causes activity churn. This brings them high fees whether it profits you or not. Usually it does not. We know so for a fact because there’s a well-established 50% mistake rate attached to all financial opinions, both expert and amateur. It’s the same coin toss no matter who’s making the call. For the sake of convenience we’ll keep calling it the 50% mistake rate, but as you can see it’s sometimes even higher. Apply this 50% mistake rate to both exiting and then re-entering stocks or funds (because you have to be right twice — not once — in order for the timing to produce a net gain), and it means more than half of the roundtrips will end up being detrimental, not beneficial. To the industry charging you for the effort, it’s a great process, which is why it’s constantly encouraged. Tossing coins and losing money can be fun with friends at a bar. But for your life’s financial goals? I don’t think so, and you probably don’t either. My name is Jason Kelly. You probably know me through one of my books. 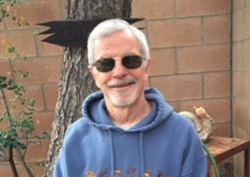 If so, thank you for continuing your time with me by visiting my website. It’ll be worth your while. If you like my books, you’re going to love my Sunday morning letter. Here’s a little background on me. I’ve been writing about the financial markets since 1994. My first book was The Neatest Little Guide to Mutual Fund Investing, published by Plume, an imprint of Penguin Random House. Since then I’ve published many other titles. 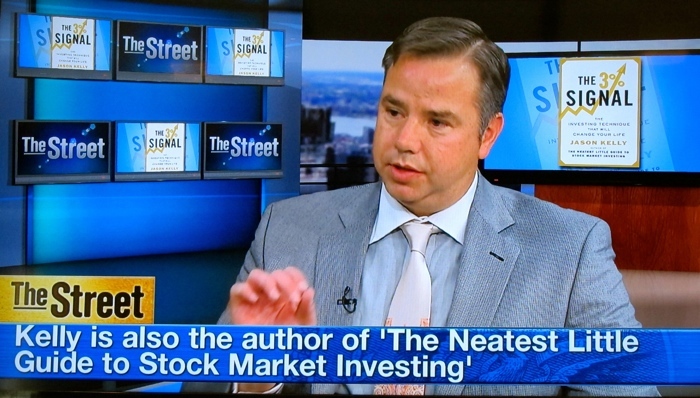 My bestselling book to date is The Neatest Little Guide to Stock Market Investing, with over 325,000 copies in print. The fifth edition boasts a 4.7-star rating on Amazon after more than 240 customer reviews, and the book is routinely a bestseller on Amazon’s Stock Market Investing list, alongside titles by other financial authors you may know, including John Bogle, Benjamin Graham, Joel Greenblatt, Michael Lewis, Peter Lynch, William O’Neil, Jack Schwager, and Nassim Nicholas Taleb. 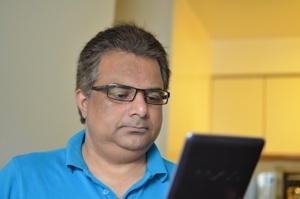 I’m a recognized financial expert around the world, with my books available in more than 10 languages. I’ve discussed my ideas on television, on radio, and in print. You might think this means I’m a financial insider, but I’m not. Never have been. I wrote that first title, the mutual fund book, as a Christmas gift for my mother in Colorado to help her with her retirement account. I printed and bound it at Kinko’s. She gave copies to other family members, who gave copies to their friends, and in this manner it made its way across a widening circle until a person I’d never met before called to tell me it was the clearest guide he’d read on mutual fund investing and suggested I get it properly published. So you see, from the get-go my writing was intended to help people, not enrich myself or, worse, a multinational financial conglomerate hiding profits offshore to avoid taxes. My goal was not to fleece people, it was to help them save money and get ahead. I didn’t want to trick them into paying for services they didn’t need. I wanted to unscramble the jargon of finance, expose the industry’s tricky fees, and find the most affordable safe way to extract stress-free profit from the stock market. I never worked on Wall Street. I never managed money. Instead, I researched, tested, repeated, and wrote about what I found. I wanted to deliver a system that was cheap, effective, and easy. To report my findings and protect people from the predatory habits of the financial industry, I began publishing my weekly newsletter. It started as The NeatSheet for readers of my Neatest Little Guides, but later became known by its current name, The Kelly Letter. 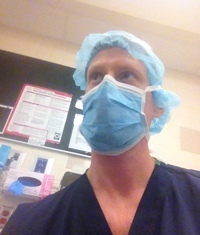 It was my real-time laboratory for demonstrating best practices as I found them. Layer by layer, component by component, these best practices appeared. Over the years, I discarded what didn’t work and kept the core elements of what did. What I found and reported across many years of researching and testing surprised me. It will surprise you, too. It’s hard to believe that a multi-trillion-dollar industry can exist on a fundamentally flawed premise, but it’s true and the industry knows it. The masters of fine print know that what they’re selling will fail a majority of their customers just as the cigarette makers knew decades before admitting it that what they’re selling is bad for their customers. Cigarettes will darken your lungs. Stock-picking will darken your fortune. 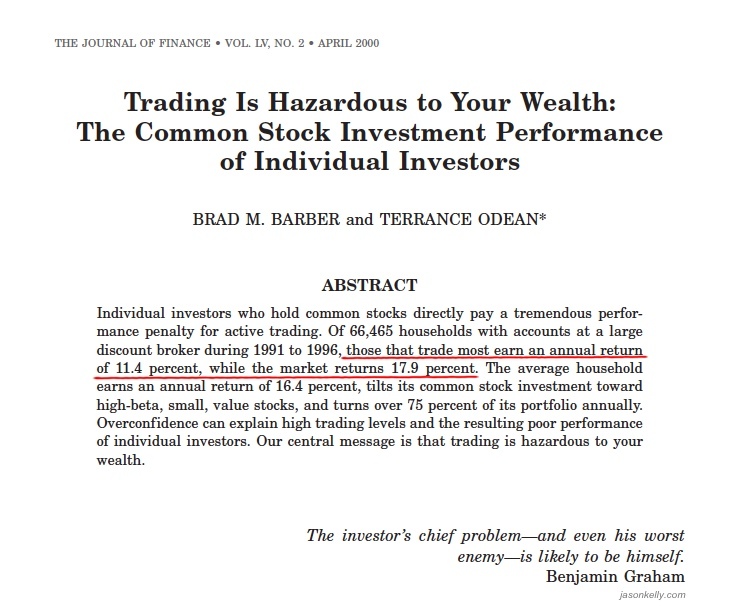 Only fools stake their future on individual stocks. There’s simply too much that can go wrong. Management teams make mistakes, or lie, or both. To get around this company risk, most advisors diversify client portfolios. Then the client ends up owning 20 or 30 stocks on the thinking that if one falls apart the overall value will hold steady. The group of 20 or 30 stocks just mimics the general stock market, making the ordeal of picking, buying, and managing them a waste of time because an index fund does the same thing with just a single investment. If you’re going to end up with market performance anyway, why not just own the market? It’s cheaper and easier. If you think we’re getting into the weeds here, the money honchos are glad to hear it. The phrase is music to their ears. “Sure!” the financial operatives will reply, and merrily set you up on a program that will siphon off tens or even hundreds of thousands of dollars in management fees over your lifetime. Think of what a difference not losing that money would make to your future. If you could prevent such a loss while also boosting performance, wouldn’t you do it? If so, keep reading and join me. Index funds are good to own, no doubt. They’re better than anything involving some money manager’s idea-of-the-day. But I wanted more for my readers. For example, how should you manage your index funds? Just owning them is not enough. Index funds are only ingredients, not a recipe. You need a portfolio plan for the funds. 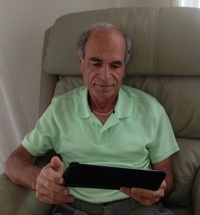 Readers wrote to me explaining the hardships they’d experienced in the stock market and were hoping to fix by joining me. I’ll never forget the letters about fortunes lost in the dot com collapse. Some families needed to give up sending kids to college due to deflated accounts. Others needed to postpone retirement. They got through that one, and then the next crash happened. Now, they’re worried about the next one. It never ends for people stuck in the whirlpool of stock market predictions that sink half the time. Trailing the market in good times is not much better, either. In the run-up to the subprime mortgage crash of 2008, people complained about missing out on gains. Too many of them chased stocks just before the market crashed again, then stayed on the sidelines during the recovery, creating maximum frustration and worst-possible performance. They suffer stress from indecision, stress from money lost, stress from profits missed. This stress leaks into other parts of their lives, ruining family gatherings and vacations and moments that were supposed to have been fun. This is not how it should be. This is not how it needs to be! I understand why people are angry about needing to participate in the chancy casino of stocks. They don’t want the headache of Wall Street in their lives. But they need to invest for a better life and to retire one day with more than cans of soup and yogurt on the menu. Lifetime employment is gone. Heck, for many people, steady employment is gone. Social Security hasn’t kept up with inflation. Insurance companies are notoriously dishonest, certainly a pain to deal with even in their best moments. One reader described them to me as “professional claim deniers,” and anybody who’s ever dealt with one nods in agreement with that description. Nope, we’re all on our own and one of the only ways to make sure our savings grow toward a future we want is to tap the stock market. Whether in a regular brokerage account, a 401(k) or an IRA in the United States, or an RRSP or TFSA in Canada, or any other type of account, your prosperity is in your own hands and its growth will come from the stock market. You will find few friends among the banks, the markets, the money managers, the political process, and the tax system. I’d rather not write about it but I have to because, unfortunately, it’s from this pit of vipers that profit emanates. The good news is that it’s possible to extract the profit without the venom, but you need a proven framework and process to do so. I’ll come back to the proven framework and process in a moment. Before that, ask yourself how an investor finally gets fed up with the whole mess and decides they need a better way. Sad to say, but it’s usually by trying the many bad ways first. Most investors hire experts to guide them through the money vipers, but the experts get it wrong half the time. Their track records are no better than the amateurs. They buy A and avoid B, only to see A crash and B soar, then they hustle to catch up by buying more of A for a recovery and betting against B for its reversion, only to see A fall farther and B rise higher. No wonder investors are pulling their hair out! Not just the beginners, either. Wealthy investors are just as ticked off. You can tell how frustrated they are by how many of them switch advisors. 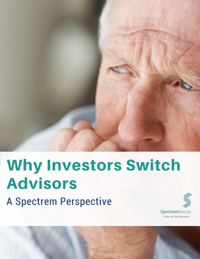 A 2015 study by Spectrem Group found that more than half of High Net Worth investors have switched financial advisors in their lifetime, while nearly a quarter of Affluent investors switched advisors just within the past five years. Once the advisors fail them, where do desperate investors turn next? Many fall prey to hyped financial letters claiming they earned large returns on past ideas and possess an ability to call the financial winds. 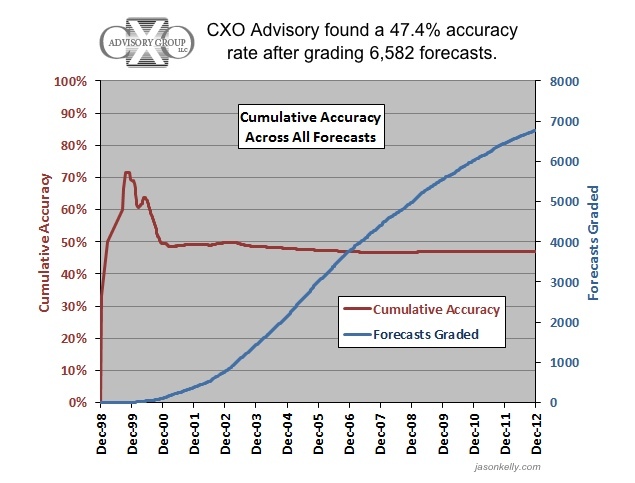 Prognosticating newsletters take investors right back to the 50% mistake rate of faulty forecasting. The fundamental analysts are wrong half the time. The chartists are wrong half the time. At this point, investors throw their hands up. The banks and brokers charge a lot but are wrong half the time. The financial advisors charge a lot but are wrong half the time. The prognosticating newsletters make big claims but are wrong half the time. Friends, family, and co-workers are wrong half the time. What the…? Eventually, it dawns on observant investors that everybody is wrong half the time, including themselves! It seems there’s nowhere to turn. Nerves are shot. Patience is at an end. Vexation and bitterness set in. Yes my friend, there comes a time when each of us realizes that the emperors of the financial system have no clothes. The 50% mistake rate reveals their naked posturing. Verified in countless studies and presented at length in my newest book, the 50% mistake rate is one heck of a hurdle. It’s an ego-bruising statistic that the highest-paid money managers and analysts refuse to admit, even though the data is staring them in the face. They think they’re smarter than everybody, some even consider themselves masters of the universe, but along comes honest accounting to expose in no uncertain terms that in the realm of financial forecasting, they’re just as average as anybody else. We all are. You, me, and the hedge fund managers. Watch financial media long enough and you’re bound to see the heroes of one news cycle become the goats of another. Why do these cover story superstars flame out? Because they’re investing on hunches and dependent upon luck. They regularly appear in media because there’s a lucky somebody in any given time frame who can be held up as an example to keep the greed juices flowing. The problem is that hunches and luck are usually not repeatable. We can’t feel confident that lightning will strike the same guesser twice. They got lucky last time, but next time? Who knows. Frequently not, so they fade from the lime light as the new lucky manager steps in. I’ve seen this so many times that I now view media praise of a money manager as a predictor of trouble ahead for that person. Some call this the curse of the cover story. These money managers are human and therefore wrong half the time. We could forgive this, except that they bet too much of their clients’ money on ideas that don’t pan out. They (the money managers) get paid even when they lose money for their clients. 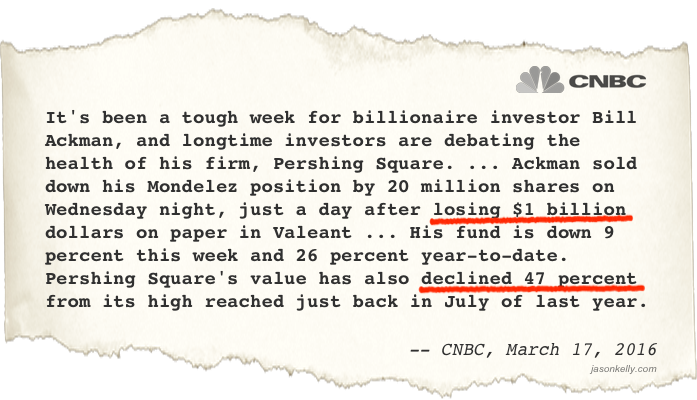 The latest plummeting superstar is Bill Ackman at Pershing Square Capital. The billionaire hedge fund manager stepped on his tie with a growing commitment to disgraced Valeant Pharmaceuticals (VRX). Shares of the firm fell more than 50% on Tuesday alone after it issued weak earnings guidance and mentioned it might have to default on some debt, just two weeks after canceling an earnings release. It didn’t help that its CEO took a two-month medical leave. Another challenge for Pershing is the reversal of its reputation. When it went public, Ackman boasted of the ‘Pershing pop,’ a tendency for the price of what his firm bought to keep going up because others respected his judgment and wanted to own what he owned. That respect is in tatters these days, such that the ‘Pershing pop’ might become the ‘Pershing plop’ as other hedge funds avoid what Ackman chooses, or even bet against it. 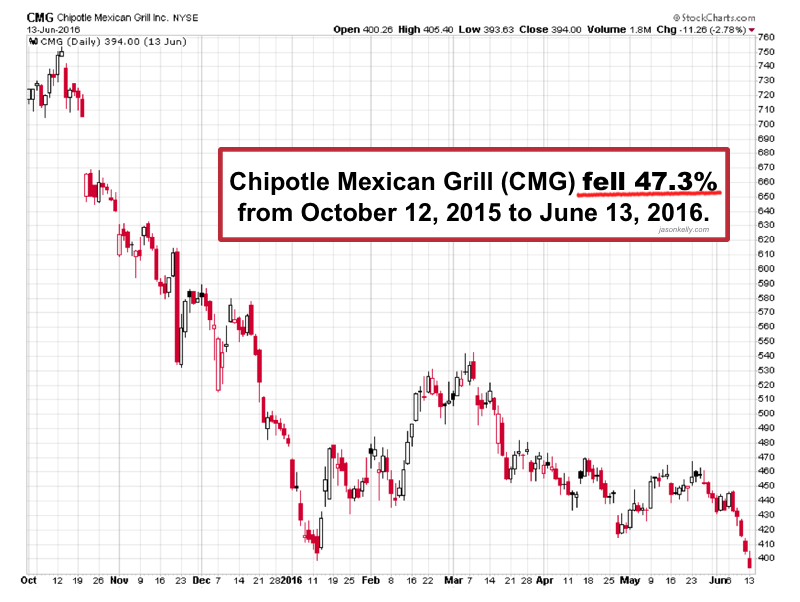 This could pressure prices in Ackman’s portfolio even lower. Worsening the Pershing plop has been the firm’s bad luck on the other side of betting as well. Ackman guessed that shares of Herbalife (HLF) would drop, but they’ve risen 42% since February 8. Now, don’t shed a tear for Ackman. He’s doing fine with his billions. That’s the beauty of collecting management fees from people no matter where performance goes. If you’re going to shed a tear, do it for his long-suffering clients. They’re the ones taking it in the teeth for his mistakes. People like Ackman getting rich no matter what happens to their clients are traditional fixtures in the money business. 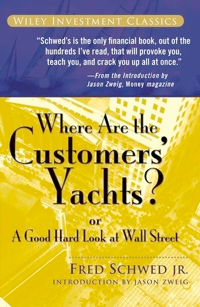 The Ackman saga calls to mind the title of Fred Schwed’s investing classic from 1940, Where Are the Customers’ Yachts? It refers to an old Wall Street yarn about a visitor to New York admiring the yachts owned by bankers and brokers, and asking where the customers’ yachts were. This problem persists today: Financial advisors get rich whether clients do well or not. “Guessing is best reserved for fun and games, not money management for a better future. In the end, steadily and surely, automated intelligent reaction outdistances professional guessers by a wider and wider margin, while costing far less in fees. It’s time to stop trusting the experts and confront once and for all what’s going wrong here. they’re wrong half the time, same as you, me, and billionaire hedge fund managers. As with alcoholism, the first step toward fixing what’s wrong is admitting you have a problem. The problem for investors is the 50% mistake rate. I’m happy to tell you there is a safe way to extract high performance from the stock market while suffering no stress from indecision. None. 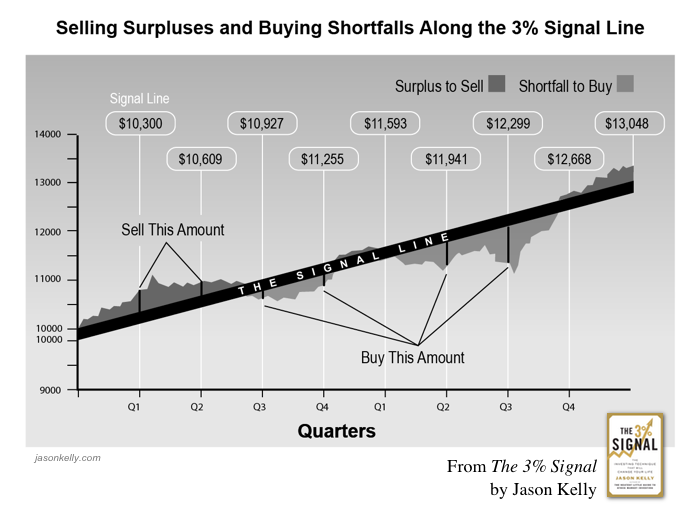 It’s called The 3% Signal, and it’s the stock market’s new best practice. It is the crowning achievement of my years of research, testing, and repeating. It combines simplicity, clarity, affordability, and even emotional support in one straightforward plan that works in whatever account you have. 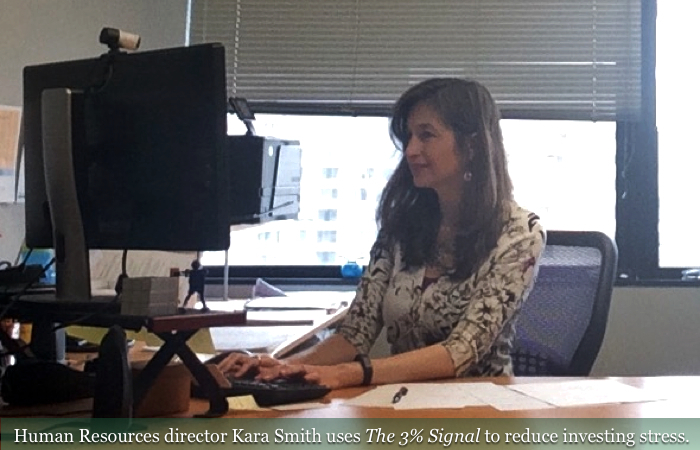 No matter what ETFs or mutual funds are available to you, the signal system is ready to begin working its magic on the two most suitable ones. Yes, just two of them. One for stocks, and one for bonds. Not 20 or 30. Just two funds. Running these two with the clarity of an easy signal that my calculator will generate for you at the end of each calendar quarter means you will no longer pay attention to media attempts to make you fearful or greedy. 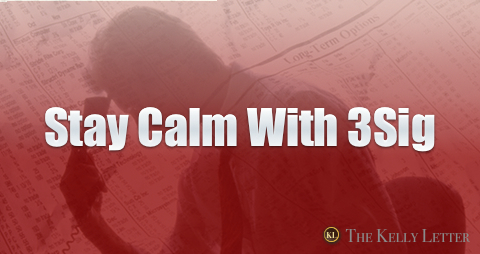 You will experience no stress from headlines that cause advisors to panic and hedge fund managers to face plant. You will automatically strike the perfect balance between safety and performance. You will feel secure that you’re doing the right thing without obsessively monitoring the market. This plan won’t just survive the fluctuation, it will parlay it into greater profits for you. The industry and its media arm have taught an army of investors that rising prices are good and falling ones are bad. When stocks go up, news reports include photos of jubilant traders as if they’ve just won the lottery. These are the messages drilled into people. Rising prices are a reason to be happy. Falling ones are a reason to be sad. Your job as an investor is to own rising prices and avoid falling ones. First of all, nobody knows which prices will rise and which will fall, or when, or how long it will take for them to reverse. This is a fairly big problem, wouldn’t you say? Besides, saying rising prices are good and falling ones are bad misses that both are equally important parts of the profit process. Neither is inherently good or bad. They’re both necessary. breathing in or breathing out? It’s silly, isn’t it? There’s no answer because respiration requires both breathing in and breathing out. So it is with stock market profits. The profit process requires both buying and selling. When you’re buying, you’d rather have low prices, not high. When you’re selling, you’d rather have high prices, not low. As a successful investor, you must both buy and sell, which is why you need both falling and rising prices. It’s just math. But, here’s the rub: Your emotions, like everybody else’s, will get in the way of the simple fact above. 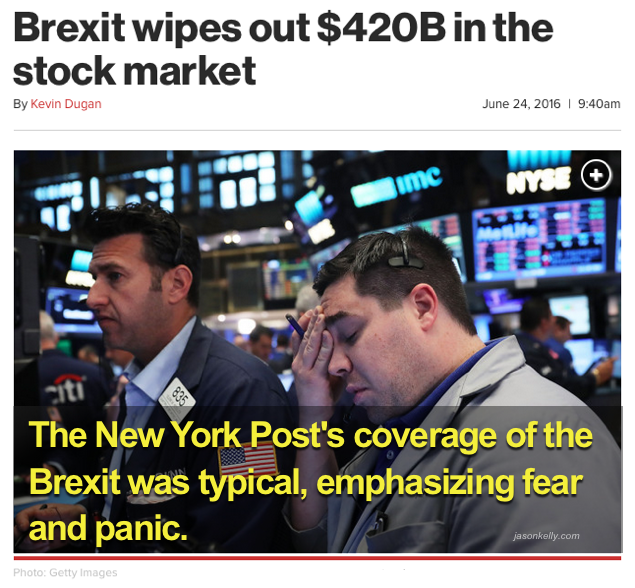 Making matters worse, the financial media will fan these emotions in the wrong direction. If they reported on respiration, a headline might read: “People Exhale, Panic Sets In” or “People Inhale, Jubilation Follows.” It’s roughly how they report natural price fluctuation in the stock market, and it’s just as silly. When prices rise, you’ll naturally get greedy for some of the profit and the media will fan this greed and encourage you to buy at the wrong time. When prices fall, you’ll naturally fear losing money and the media will fan this fear and encourage you to sell at the wrong time. Here we are back in the greed/fear cycle that kicked off this discussion. What would help you do the right thing at the right time? A formula that generates a signal. Specifically, The 3% Signal formula. This is no arcane black box, though. There’s no prediction taking place. It doesn’t foretell the future. It reacts to what already happened, which is as sensible as this business can get. 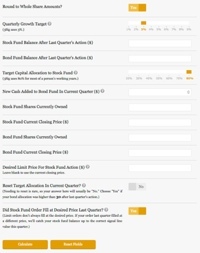 When profit in your stock fund exceeds 3% growth in a quarter (such as a $100,000 balance becoming more than $103,000), the formula signals you to sell the surplus and put it in your safe bond fund. Notice the logic at work. Notice that it’s a repeatable process. Notice that it requires nothing more than fluctuating prices. You do not need to hope that I guess the future correctly or get lucky one more time. I don’t guess the future and I don’t depend on luck. I don’t even care which way prices go. I just run the system in the letter to show you how to run it with your money, and it keeps working. You’ll automate the investment masterstroke of buying low and selling high — without ever trying to guess what’s going to happen next. You won’t care. Why? Because if the next quarter delivers higher prices, your signal will tell you to harvest profits again. If it delivers lower prices, your signal will tell you to jump on the bargains again. No hocus pocus, and certainly no expert speechifying. Once you start this signal system, you’ll string together an unbroken series of correct reactions to price movement. The little gains achieved through mechanically buying after drops and selling after rises will add up. The system will become your never-ending advantage over the market. It will bring you satisfaction and confidence. This simple process, repeated quarter after quarter, beats the stock market’s natural upward movement and runs circles around the so-called pros, who lose to the market due to their 50% mistake rate. That’s how it works. Now, let’s see how well it works. I want to keep this realistic. Too many performance presentations slap a bunch of big figures together and expect you to ooh and aah over them. I respect your intelligence, so will present exactly how impressive the signal system’s performance is over time, with no exaggeration. On the contrary, I’m going to be conservative. In The 3% Signal book, I show how an investor named Mark runs the plan in his 401(k) using two low-cost index funds. Here, I’ll compare Mark’s plan with a typical portfolio that an investment advisor would assemble. 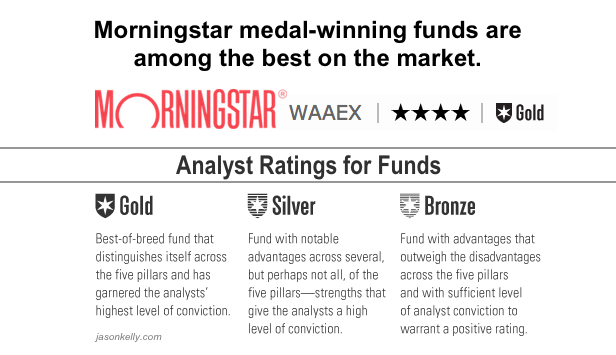 I’m going to call it the Morningstar Medalists portfolio because it’ll use a group of Morningstar medal-winning funds managed by experts. These are among the best-of-the-best funds, according to Morningstar, not just run-of-the-mill funds. Into both plans, we’ll invest new money every quarter based on Mark’s salary and company matching. In this manner, both plans will receive the same amount of cash over time. You probably agree that this performance comparison is impressive, but in real life the gap between the two plans is much bigger than the 41% shown above. Why? Because almost nobody runs a perfectly executed plan into just four medal-winning mutual funds. Instead, they end up owning a little of this and a little of that instead of just the very best funds. They experiment with one-off stock ideas, switch from one set of funds to another, hide in cash at bottoms, go all-in at tops. These mistakes happen in response to fear and greed stoked by the media. That’s why real-life performance for most people is far worse than the results of the Morningstar Medalists portfolio shown above. 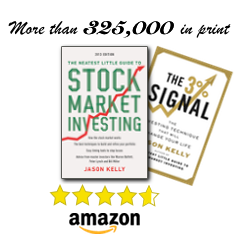 In the book, I demonstrate the impact of applying a 50% mistake rate to even the highest-performing stock, and we can do something similar here. We won’t get as detailed as I did in the book. 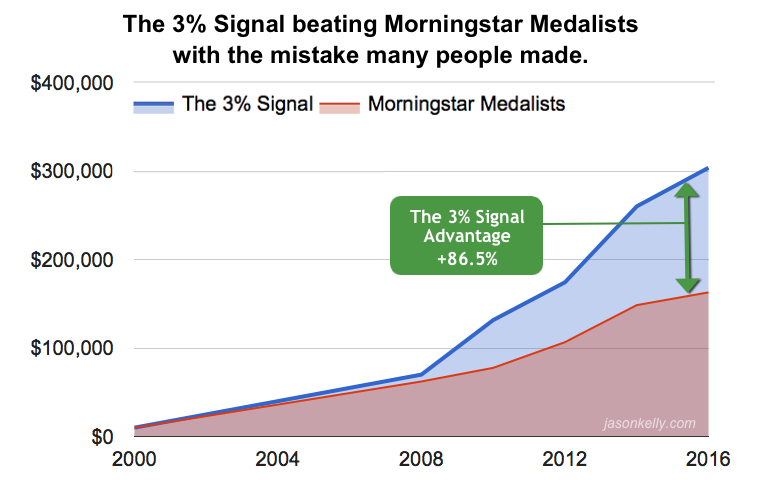 Instead, we’ll add just a single mistake to the Morningstar Medalists portfolio, but one that many people made. What was it? Bailing out of the stock market at the bottom of the subprime mortgage crash, and missing the recovery. Later, ICI would report that by the end of the year, stock funds had lost $234 billion. 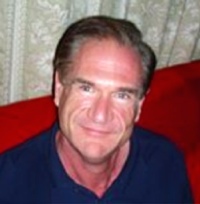 Nearly 42% of equity capital cashed out of cascading prices from May to December of 2008, and investors panicked out of every fund category tracked by ICI: domestic equity, world equity, hybrid, total bond, taxable bond, and municipal bond in September, October, November, and December of that year. The supposed smart money didn’t behave any more intelligently. My friend, that’s what the mistake rate looks like in living color. The amateurs sell when they should be buying, and so do the pros. It’s a universal shortcoming of our emotions when met with financial chaos. The 3% Signal prevents this irrational selling when prices are cheap. In fact, the more the market falls, the more it signals to buy, exactly the opposite of what the media and our emotions tell us to do — but exactly the correct move to make. So, what happens when we apply that common mistake of 2008 to the Morningstar Medalists portfolio? Let’s find out. We’ll move the portfolio to cash at the end of 2008, then back into the funds at the same allocation two years later, which is generous since media said at the time that another crash was on the way. Many people who bailed out back then are still hiding in cash. How about that? 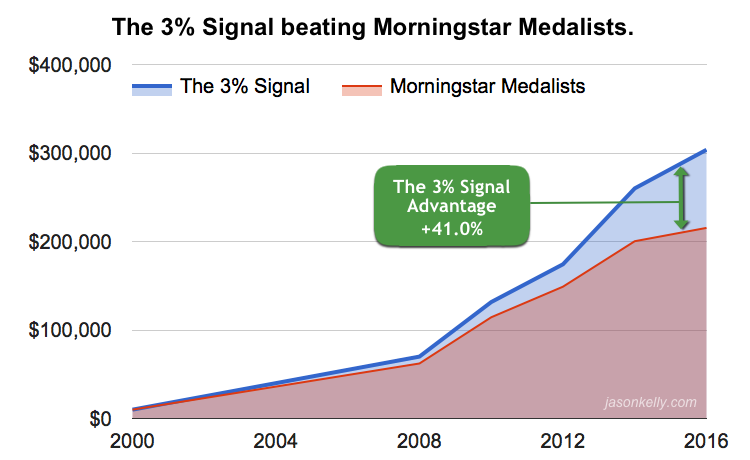 Just the one mistake of bailing at the end of 2008 and saving everything in cash for the next two years reduced the Morningstar Medalists’ ending balance by 24.4%, which boosted The 3% Signal’s over-performance to 86.5%. If one mistake could have caused this much damage, just imagine how badly multiple mistakes would degrade the balance. And remember, most people’s portfolios are worse than the Morningstar Medalists. It’s easy to see why you’ll feel much happier using The 3% Signal. Over your lifetime, its superior performance over other approaches to stock market investing could make the difference between retiring rich and retiring poor — or even retiring at all. Because the plan uses just two low-cost index funds and never needs expensive advice, your investing costs are reduced to almost nothing. Most brokerage and retirement accounts don’t even charge trading commissions anymore if activity is kept to a low frequency, and with The 3% Signal plan your activity is limited to just four times per year, at the end of each calendar quarter. Index funds have no manager at the helm to inject the 50% mistake rate of guesstimation. The funds own just raw, unmanaged portions of the market, thereby delivering higher performance than actively managed funds at a much lower expense. There’s no luxury-car-driving manager to pay, after all. This is one irony of the business. The more you pay a manager, the more they’ll meddle, thus the more mistakes they’ll make, and the weaker your performance will become. Just ask Bill Ackman’s clients. In the investing business, if you’re not careful you’ll end up paying fees to lower your performance. I’m going to make sure you avoid this. One of my favorite features of the plan, however, is not performance or savings, but the sublime calm you’ll feel after melting away your investing stress. You’ll relax in the comfort of knowing you’re on a path of strong growth with no rip-off costs eating away at your future. When you encounter a frightening article, a sensational news story, an opinionated coworker, or anything else that makes you wonder if you should do something with your money, you’ll be able to comfort yourself. The best part about this is that it’s true. You’ll feel good about managing your own portfolio with a simple signal. You can do this, even if you don’t know or want to know the ins and outs of the stock market. My non-financial friends and family run this plan on their own, and wonder how they ever got by without it. Funny thing is, my financial professional friends say this, too. You’ll feel the same way. I can say so confidently because it’s true whether you’re a total rookie or a pro. The rookies with no interest in the market are happy to finally be doing well. The pros are amazed by the plan’s ability to beat everything else they’ve tried. One by one, they cancel the guessing-game newsletters, discontinue advisory services, and consolidate their accounts. They sit back and marvel at their streamlined plan that’s doing better than they did before, without all the frenzy. But probably the biggest reason you’ll reduce investing stress in your life is that you’ll free yourself from the greed/fear cycle of the industry and its media cohorts, who forever conjure up new ways to distress you. They imply that you’re supposed to take action with every new perturbation in the world, even though nobody knows what action to take. They said in summer 2013 to sell bonds because interest rates would rise, but rates didn’t rise for two-and-a-half years. Even after rates finally ticked higher, the bond market was fine. Investors protected by The 3% Signal didn’t panic out of the bond market and collected distribution payments the whole time. Instead, stocks hit all-time highs in the six weeks following the vote. The S&P 500 rose 7.1%. Even in the UK, the heart of the supposed crisis, stocks rocketed higher. The FTSE 100 index of the largest companies on the London Stock Exchange rose 10.7%. The pros panicked. The signal profited. The conflicting and low-reliability opinion stream from forecasters causes great stress in your life. Then, it adds insult to injury by harming your investing performance. The signal system’s strength is that it does not make forecasts. It reacts, and reacts appropriately. 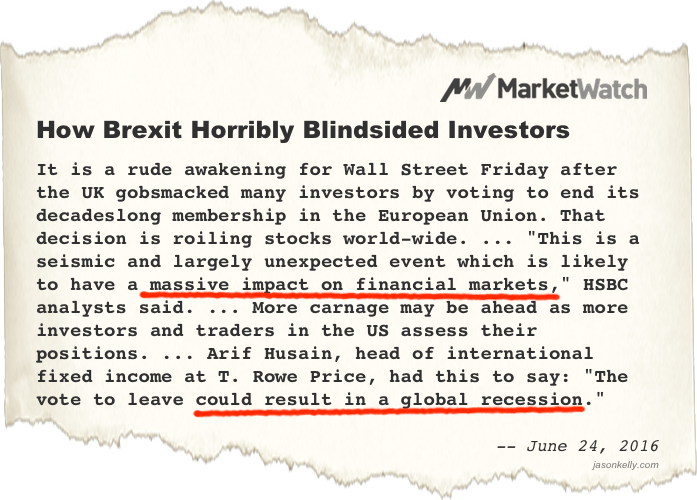 It didn’t confuse investors by guessing the future of the bond market in 2013, or the stock market in the Brexit. It just reacted to prices, not caring whether it was a Fed speech or a geopolitical event pressuring them. It could have been a Martian landing, for all the system cares. Price movement is price movement, regardless of the reason, and the system delights in it. The accomplishment of the letter through the bond panic and the Brexit, and many others, is that it willfully ignored the guessing games of the talking heads. It’s indifferent to the direction prices take. Had prices collapsed following the Brexit, The Kelly Letter would have bought more shares at lower prices on its next scheduled action at the end of that June. No big deal. Because prices went powerfully higher, however, the signal ended up selling a few shares to book a profit. This rational response to price movement, repeated every quarter, will give you an edge over the market and those who pretend to know where it’s going next. You won’t believe how much happier you’ll become once you learn to laugh at media meltdowns. If you’ll permit me a moment of philosophical musing, I’d like to tell you that I’ve found a deeper wisdom from many years of researching and then implementing The 3% Signal. Rising above the fray of the stock market, one of humanity’s most fervent endeavors into which enormous intellectual capital is poured, and doing better than the breathless commentators by retreating into silence and near inaction, is instructive. People who meditate talk of the need to escape our “monkey mind,” that always active thought device between our ears that fires off random notions. If we can acknowledge its existence and tame it, we can achieve greater contentment. The stock market is humanity’s monkey mind writ large. For many, there is no greater cacophony, no greater distraction from life than the news cycle connected to financial markets. The more enlightened way to navigate the market is by letting it all go, reducing the chaos to a concise list of prices, visiting that list just four times a year, letting an unemotional formula tell you what the prices mean you should do, and then doing it. This higher state of investing not only performs better, it costs less and uses less of your limited time on Earth. If you’re ready to upgrade your investments to The 3% Signal, you’re in good company. On the other side of this website’s paywall are thousands of people who escaped mainstream financial hardships and automated their investing, and boy did it make a difference in their lives. 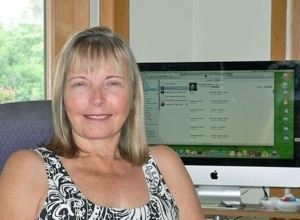 Kara Smith has worked in human resources for eighteen years. She’s the HR director for a government contractor in Alexandria, Virginia. She wanted to reduce the frenetic pace and stress of the way she was managing her portfolio, and consolidate what she felt had become “quite a hodgepodge” of holdings across various accounts, including a 401(k), a traditional rollover IRA, a Roth IRA, and two taxable accounts. She upgraded to The 3% Signal. I suggested that she also disconnect apps and other tools that introduce market noise into her days. The 3Sig plan is built to thrive on market fluctuation, so there’s no need to monitor her portfolio for the right times to buy and sell. For the latest design of The Kelly Letter, I asked more than 1,100 investors like Kara what they needed in order to take control of their portfolios. They sent copies of their account literature, circling what confused them. I asked why they made the choices they’d made. I came to understand common pitfalls. I learned how to warn against those pitfalls in a way people could understand. The result of this multi-month process was gratifying. It streamlined The Kelly Letter into a focused service that protects investors from the very mistakes they’re most likely to make. It prevents what went wrong for other people from going wrong for you. Reading it will clarify your thinking, and guide you past fallacies and conflicted interests to a path of low-stress stock-market profit. Your 3Sig plan is the best investing system I’ve found. … Thanks again for the great insight and such a simple system. The Kelly Letter is always informative, entertaining, and useful. I especially enjoy your End Note, and this week’s note was moving and affirming. 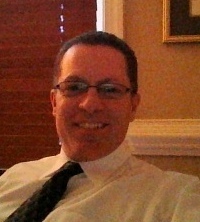 … I find your letter to be a great balance of financial and behavioral perspective, with a fine historical view. The system also favors Thoreau’s advice, ‘simplify, simplify.’ Wall Street experts are, unlike you, compulsive complicators. An effective strategy that truly takes the fear and greed out of investing. … The Kelly Letter is insightful, humorous and reflective in ways that no other publications provide. … You have no idea how much I look forward to your weekly letters. 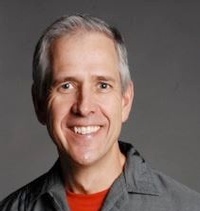 Shifting my view, as the 3% approach leads, from reactionary to curious bystander is a challenge, but Jason Kelly’s weekly encouragement in his newsletter helps me stay the course. For that alone, I’m grateful and the newsletter reinforces sanity when many other venues suggest calamity. The Kelly Letter has been a great resource and something that I enjoy reading every Sunday. 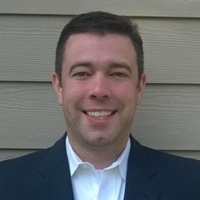 Jason, thanks for providing so much value at a very little cost. The Kelly letter is one of the only letters I have kept my subscription to over the course of the last decade. All the others I’ve lost interest in as the 3Sig system is the most rational way to invest. It’s the Ron Popeil ‘set it and forget it’ for three months way to better and safer results! 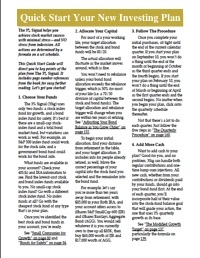 One of the most comprehensive letters I have read in thirty five years of investing. It gives me various opinions from the so-called market experts, followed by a rational way to accept or discard their points of view. Also, whether any of the turmoil occurring internationally has any bearing on our market. I get comfort in safety regardless of what the market will do next. The simple systematic approach of reacting to the market (rather than pointlessly trying to predict it) to achieve proven performance is beyond compare. All of Jason’s books are fantastic, however I feel The 3% Signal is the best to date. 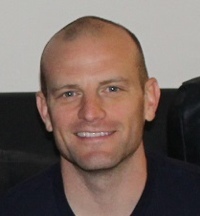 I promote all of Jason’s works to everyone I know if they want a stress free way to gain performance in the market. Once you read Jason’s works and understand his system, which is very easy to understand and implement, you’ll quickly realize all other ‘advice’ out there is worthless noise only to be tuned into for entertainment value. 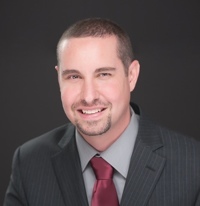 If you are looking for a high-performance, low-touch, low-stress investment approach that will truly allow you to retire wealthy, you owe it to yourself to carefully consider Jason Kelly’s approach. On the other hand, if you’ve bought into the idea that investing is great entertainment and you have back slapping celebrations when your trades go well and blame Obama, the Fed, and the Zika virus when they go poorly, then you should probably just stick with the hysterical talking heads on TV. Before subscribing to your letter, I spent countless hours reading, listening, and watching a large variety of commentary from multiple sources, trying to determine if I was doing the right thing(s) with my investments, and what I should do next. Over the years of being a Kelly Letter subscriber, I have come to understand that the vast majority of this is noise, designed to play on emotions in order to sell something or keep you watching. I now spend much less time fretting over my decisions, and simply react to what the market serves. Thank you. In a world of constant hype and bipolar predictions, Jason Kelly’s newsletter is refreshingly honest and grounded. This is real investing advice that will work with you and for you long-term. Being constantly reminded of the coin-toss likelihood of market timing is almost like a self-help mantra. You know it, but listening to it once and again makes you feel better! Jason’s letter is great for Canadians, too. 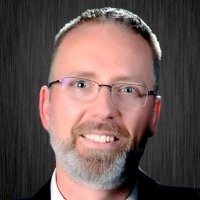 I have used his simple 3Sig approach across my portfolio, including RRSPs, TFSAs, RESPs and related spousal accounts. I’ve been a subscriber for three years. I left half of my account managed by a ‘professional’ to know in real time how Jason’s strategy compared to a professional investment manager. Sadly (or happily, depending on your perspective) the 3Sig system has consistently beaten my managed account in both up and down years. Jason’s books say this, but I guess I needed to demonstrate it to myself to believe it. Doing it this way has given me confidence to do my own investing across all of my accounts. The Kelly Letter will make the same difference in your life. This is the perfect time to improve your portfolio. The Kelly Letter every Sunday morning by email. Like no other. Many subscribers say this is the best read of their week, astonishing in its ability to distill seven days of noise into one succinct overview of the very few items that might matter. Start your Sundays right! 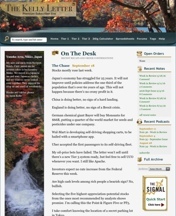 A one-page Quick Start Guide with page number references to full information in The 3% Signal. You’ll receive access to this right away so you can preview key points of the plan while your book is in the mail. The 3Sig Calculator. A thing of beauty! You’ll use it to generate your own personal signals every quarter including exact share amounts to buy and sell based on your account balances. It emails you the results to make later quarters easy by keeping last quarter’s numbers at your fingertips. Some subscribers say this tool alone justifies their subscription price. The subscriber-only section of this website, where likeminded investors are commenting on notes and discussing in forums. I join these interactions every day. They’re a treasure trove of investing tips and wisdom. The archive of Kelly Letter notes. It’s a research center, searchable and smartly tagged to make gathering time-stamped material on covered subjects easy. The subscriber podcast. I read every letter word-for-word. This feature was requested by subscribers who prefer audio learning. They listen on their Monday morning commute, during a workout, or while reading along at their computer. I like to listen via iTunes, because then I hear the emphasis where Jason intended it to be. The letter, a good cup of coffee, and the dogs lying at my feet — a perfect Sunday morning! Your money is very important to you. I urge you to subscribe to The Kelly Letter. It’s an affordable system that will significantly improve your financial future. I mentioned earlier that the high fees charged by typical investing approaches can add up to tens or even hundreds of thousands of dollars over your lifetime. You may wonder how this can be, so I’ll explain. The money that drains away in fees would have itself earned an investment return if it had stayed in the account. Thus, there’s also an opportunity cost associated with high expenses because we miss the chance to have made a bigger profit investing the lost funds. For example, a seemingly innocuous 1.5% annual fee adds up to $49,838 paid over 30 years on a $25,000 investment growing at 10% annually. Keeping that amount in the investment would have added another $109,188 to the value of the account at the end of 30 years. The fees paid and the opportunity missed come to a total of $159,026 erased from the fee-less growth balance of $436,235. The fee and its associated opportunity cost reduced the investment’s potential value by a whopping 36.5%. And, as lifetime investing accounts go, the one in this example is small. With potential savings so high in The 3% Signal, not to mention the extra profit the plan delivers, you might expect me to charge thousands of dollars for a subscription to The Kelly Letter. If I charged 2% of your savings in the above example, similar to the way money managers collect fees, it would come to $3,181. Don’t worry, I don’t charge anything close to that. For just $200 per year, you’ll receive everything listed above to completely upgrade the way you manage your investments. This is what I recommend. If you’d like to try The Kelly Letter without paying the full year, you can pay $20 per month. If you’d like to hear more from me but aren’t ready to part with any money yet, you’re welcome to join my free email list. 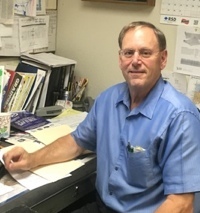 Thank you for the work you do. You’re a household name here and my wife and I often discuss your letters on Sundays. My ten- and seven-year-old children recognize your name and will eventually be taught to invest using 3Sig and 6Sig. You’ve had an enormously positive impact on our investing and inspired me to look at the world in more rational and clear terms than I did years ago. I’m sure that thousands of others would say the same. 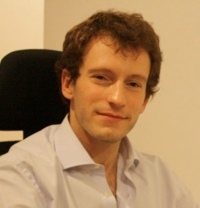 Join Matt and thousands of other rational investors to invest without stress. Subscribe to The Kelly Letter now!